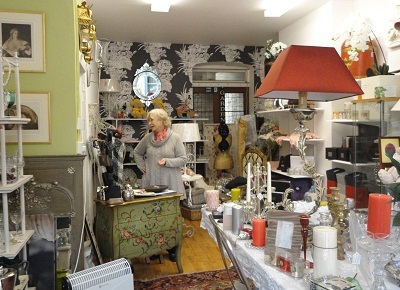 Monica Mooney's shop has only been trading in Crown Road, St Margaret's for a year, but it's a welcoming, special little shop comprised of those personal touches that chains and groups sadly lack. Monica is happy for customers to browse as she too hates pushy sales staff. Browsing and hopefully buying too, is what you will want to do once you enter the shop. 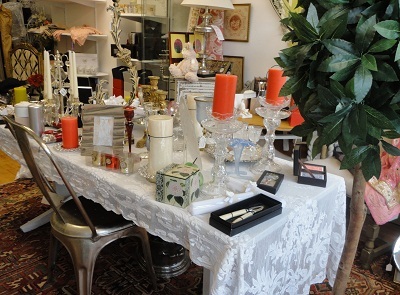 It's an emporium of antique and vintage glassware, shabby chic furniture, cushions, mirrors, lamps, scented candles, leather goods and accessories. You may find your attention caught by the beautiful wine glasses, the Venetian and wood framed mirrors or the pretty scarves and hats that are inexpensively priced; I was unable to resist a purple, Downton Abbey inspired titfer. Monica, who has a background in interior design, sources her antique and vintage stock from markets in this country and across the Channel. Other items are bought from local suppliers. You'll be able to find items for spoiling yourself, or for treating your loved ones, especially with the festive season fast approaching. You know how it is so hard to find suitable presents for the men in your life? The shop has a range of ready-boxed corkscrews and leather wine carriers that might just solve your problem. The scented candles too make exquisite presents as they are in their own containers and boxed too. What better way to relax on a cold winter evening than in a hot bath, with a glass of wine and fragranced candles to help you unwind.